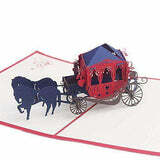 Wedding carriage pop up card has a red cover that features a gorgeous laser cut carriage pattern. The image hints just enough at the amazing surprise inside, create a romantic atmosphere. 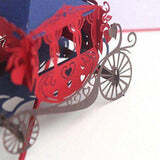 Open Wedding carriage pop up card to reveal a carriage with brown accents. A couple sitting on a beautiful and elegant classic carriage with beautiful horses. The card is also embellished with lovely wedding flowers printings and wedding details on the corner. Inspired by the fairy tales of Cinderella, we want to memorize you one of the most famous of the love story of the 80s century. Wedding carriage pop up card is an unforgettable love gift for any couple. 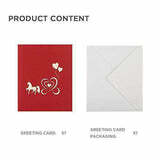 The greeting cards are packaged with envelopes which you can write a few words of sweetly blessing. Great way to send warm wishes to loved ones, also adds a touch to your gift. Fold flat to fit in an envelope for mailing. 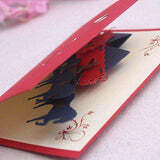 Cards are ingenious and gorgeous, will create more surprise and make your life more fantastic. Send one to someone who could use a smile. They canât help to do just that when this piece of folded paper opens up to reveal.